This lovely appliqué and embroidery panel, showing two black parrots and one yellow duck on a red background was created to exhibit with the Colombian Gold exhibition at the British Museum and displayed in the Great Court while it was on. Cotton, wool felt, rayon thread, with art board backing. Approx. 33cm x 24cm. 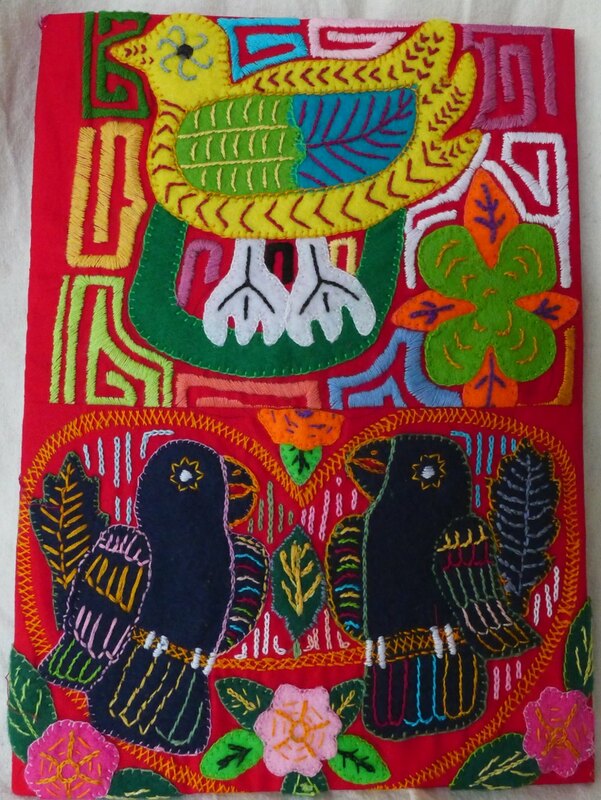 Inspired by the Mola tradition in Colombia this was handmade by women at the Cultural Art Project, Fitzrovia Neighbourhood Association, 2013. Cotton, wool felt, rayon thread, with art board backing. This is being sold by silent auction. Other smaller items will be sold outright. Please drop by between 6-8pm weekdays to have a look, register for the auction and make your best bid! All money will go towards the FNA’s community programmes. Available to view from 6.00pm to 8.00pm weekdays from Wednesday 3 June to Friday 12 June 2015, at Fitzrovia Neighbourhood Centre, 39 Tottenham Street, Fitzrovia, London W1T 4RX. All photographs by Sogand Bahram. This entry was posted in Uncategorized and tagged art, Charity, craftsale, fundraising, shop. Bookmark the permalink.